So I didn't do much knitting this weekend. I hadly did anything. I was lazy once again. Nothing new to me. Oh well, at least I relaxed. And thanks to using a bunch of sunmilk I managed not to get burned during our 2-hours walk with the horses on Sunday. Yay for me! I decided that I'm sick of trying getting a tan 'cause it doesn't work anyway and the sun isn't healthy (I'm at high risk for skin cancer) so I'm going for the white look! Don't care what fashion sais. I love the heat of laying in the sun but I hate getting burned every time. It's just not worth it. I'm not a Summer person so I'm not loving this weather, though it's not really bothering me. People are complaining it's to hot, while a few weeks ago they were complaining it was to cold for the time of the year. People should make up their mind really. I do hope we'll have a proper Summer, but on the other hand, if it just doesn't rain I don't care how hot it gets. Well, I don't mind rain, just not all the time! And I have to say I didn't even removed it all! The black cat in the picture - Spike - started enjoying the brushing in the end. She was the one that showed me the hair she was loosing! The other cat in the picture - Angel - was the one that didn't need the brushing. Third cat - who didn't want his picture taken yesterday - has semi-long hair and needed the brushing really badly, but he didn't like it so after 10 min I stopped. I had already removed quite a lot of hair! 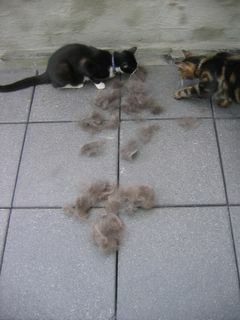 So when I was done the cats came checking the hair on the balcony! :D So funny! I kept the hair. I'm going to see if I can blend it with some wool and then spin it! :D Nice experiment I think! So tonight I'm going to plant some plants - it's late but at least now the temperatures aren't to high anymore - and I have some yarn soking to get dyed! Yeah, finally. I've been putting this on hold for days now. I tried calling my grandmother to see if she had some old pots to use with the Jacquard dyes but she didn't pick up her phone. So for now I'm not trying those. I am going to try the Tinfix dyes I got at the local art shop with one old oven dish I'm having. All the other stuff will be dyed with KoolAid. And I found some Easter egg dye in one of my drawers which I should test soon too. If someone can help me : I'm looking for not so expensive mohair that can be shipped to Belgium. Doesn't have to be roving, can be curls. I saw some great deals on Ebay but I'm not sure if that's the cheapest way plus the ones selling curls wouldn't ship international. Secondly I'm also looking for wool rovings. Can be in the UK, or in the US. Just not to expensive and possible to ship international. Last I'm looking for a place to order a good sturdy ball winder. I'm willing to pay a bit more if that gives me higher quality. Again, low price and International shipping are the deal! Off now, to pull on some old clothes and start planting and dyeing! I just came across your blog from the Knitting Blogs website, and I am enjoying reading it. Where in Belgium are you located? I live in Germany, but we're headed for a short trip to Antwerp, Brussels and Brugge next week. I wish I could help you out with finding places that ship overseas, but they seem to be few and far between. I hope you do find something.